Want to make a statement with a hand-blown glass pipe in shape of Patrick the Starfish, from “SpongeBob SquarePants”? Or maybe a good or evil Minion is more your style. Either way, we’re sure you keep in mind that the wide array of pipes offered by Kulture is for smoking tobacco, of course. The head shop has four locations and also offers public demonstrations on glass blowing. 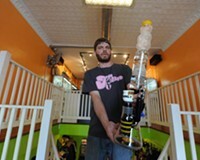 Katra Gala on Main Street brings a complexity to smoking with bongs fitted with fritted disc perks and recycler tubes. Green House Glass in the Fan also stocks a pipe in the shape of a worm on a fishing line that will have you hooked.